Venezuelans fleeing their country's economic and political catastrophe pour across the border into Colombia last month. Heart pressure pills. Diabetes drugs. Post-surgery pain killers. All the meds that are scarce or non-existent in Venezuela – which is home to the worst economic collapse in the world today. Ferro works for Cuatro Por Venezuela, or Four for Venezuela, a Houston- and Miami-based Venezuelan expat group that sends large, covert shipments of food, medicine and other goods to her native country. A fifth of Venezuela’s children are malnourished today – and a new report by doctors there shows the health system is wrecked. Still, the authoritarian socialist regime won’t accept international aid. Ferro says that makes NGO shipments like Cuatro Por Venezuela’s “vital – a matter of life and death. In recent years, groups like Cuatro Por Venezuela have focused on getting necessities distributed throughout Venezuela itself. But now they’re having to pivot. Last week, Ferro was preparing her organization’s first shipments outside Venezuela. As in Cúcuta, Colombia – a city on Colombia’s border with Venezuela. Hundreds of thousands of Venezuelans are fleeing there today in search of food, medical care and jobs. In the past year, many of them have decided to stay in Cúcuta. But they’re straining local resources – and now they’re often finding it as hard to live there as it was in Venezuela. “Thousands of Venezuelan men and women are knocking on doors there begging for food,” said former Venezuelan Sen. Pablo Medina, who visited Cúcuta last month and shared his findings in the Venezuelan enclave of Doral just west of Miami. “They’re flooding hospitals and schools there as well,” Medina said. “To survive there, a lot of people are doing anything,” says Rafael Moros, a Miami paralegal and Venezuelan expat who has close relatives who’ve gone to Cúcuta. Their disturbing reports echo international media accounts. Moros says his college-educated nephew has been reduced to selling bags of limes on Cúcuta’s streets to get by. The situation gets worse by the day – and recent attempts by Colombia’s government to stem the flow of Venezuelans have had little lasting success. 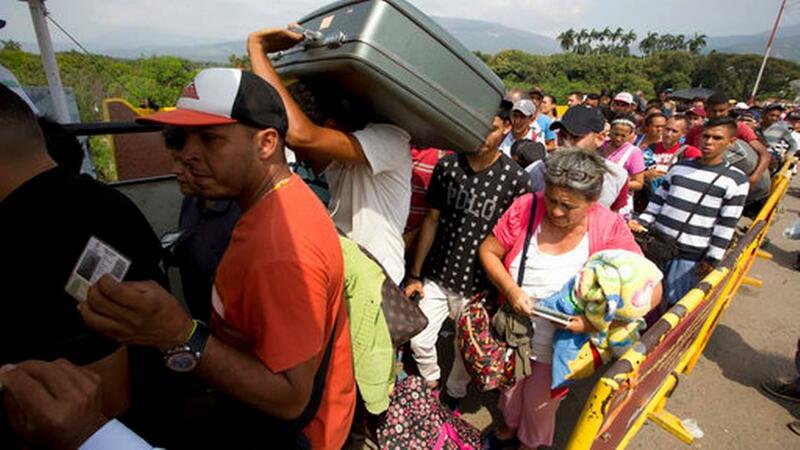 Which is why expats like Medina and Moros, who represent the new International Coalition for Venezuela, are calling on the U.N. and the U.S. to formally declare these Venezuelans refugees. They point out the numbers and desperation of migrating Venezuelans now rival that of Syrians escaping their country’s catastrophe. “We need that humanitarian help around the world going to that border zone,” says Moros. The U.N. has yet to give the Venezuelans refugee status, but it’s getting close to an international consensus to do so. More than a million Venezuelans have left their country in the past five years, going to Colombia but also Brazil and other countries. Because their living conditions are usually so bad in the border areas where they settle, the U.N. is now asking host countries to offer Venezuelans treatment similar to what formally declared refugees get. And it’s urging other countries like the U.S. to help them. Boxes of assorted medicines being packed near Miami International Airport for shipment to Venezuelan refugees on the Colombian border. “I plan to carry this message to the United States and other nations around the world about the Venezuelans that are starving to death,” Beasley said. “This is a crisis that’s largely gone under the radar in terms of the humanitarian fallout and the forced migration,” Green told the House Foreign Affairs Committee. A few days later – with the situation in Colombia still deteriorating – the Trump administration said it would consider sending almost $10 million more. But until that large-scale aid gets bigger, the smaller-scale help from expat groups in Miami like Cuatro Por Venezuela will still be vital. As hundreds of thousands of desperate Venezuelans pour out of their country, calls are growing to officially designate them as refugees. The United Nations has now taken a big step in that direction. The numbers – and the suffering – have simply gotten too big for the international community to ignore. Venezuela’s economy is in the middle of the worst collapse in the world today. Food and medicine shortages are catastrophic. Since 2014, more than a million people have fled the country - and the number of Venezuelans seeking asylum abroad has risen 2,000 percent. Venezuelans are fleeing to places like South Florida because of their country’s humanitarian crisis, but also because of its human rights crisis. On Thursday the University of Miami was a focal point of the outcry over the socialist regime’s abuses. More and more, the international community is waking up to the worsening human rights situation in Venezuela. This week, the U.N.’s High Commissioner for Human Rights called for an inquiry into reports of hundreds of killings of civilians by state security forces. 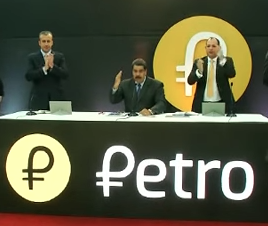 Is Venezuela's Petro A CryptoMilestone For Digital Currency – Or A CryptoMillstone? Last week Venezuelan President Nicolás Maduro said his country had found “the perfect kryptonite to defeat Superman!” By Superman he meant the U.S. And by kryptonite he meant cryptocurrency – el petro.